On Thursday 24th of November 2016 Startupbootcamp Berlin organized the yearly SBC Berlin Demo Day. As mentor I had the honor to attend the event and see the results of 3 months “accelerating” about 10 startups. According to the yearly tradition SBC’s founder Alex Farcet (@alexfarcet) updated us with the last development. As SBC’s founder, Alex started the SBC program in Berlin himself and he is as always very committed. This year the presentation was not so much about the hard way of pushing SBC to become the one the biggest and greatest accelerators worldwide (which is an amazing achievement) but Alex mentioned a very interesting fact (at least for me), namely that the new role of the Accelerator is the Human API between startups and corporates. Worldwide the Accelerators take a small but very serious piece of the pie of total R&D investments from Corporate companies. 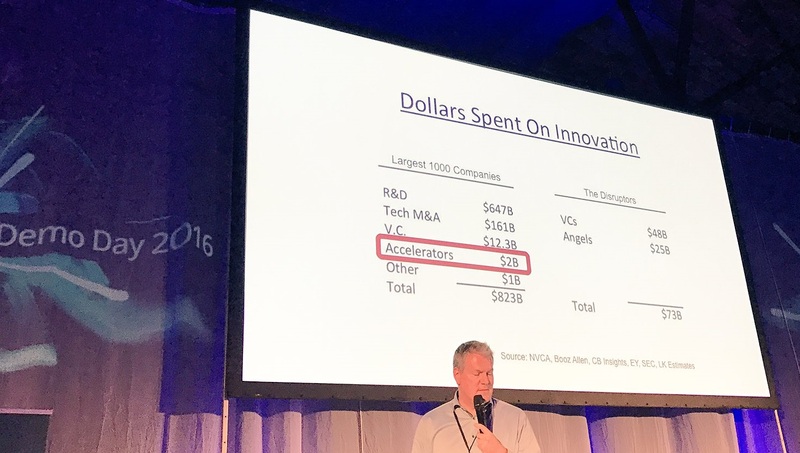 Accelerators take already $2B from the $823B and it is growing fast. Relatively still low but absolute an enormous amount of $$. Probably it also means that startups can better focus more on corporates then on the VC’s to get it financed. Unfortunately, there is always a reverse side to the medal. If a founder left the corporate culture to starts an own company in a startup culture. By getting a corporate investor on board you may be back in the not so beloved corporate culture.